I haven’t really been big into gaming lately; aside from the upcoming BioShock, I’m pretty clueless as to what’s really out there now for the Xbox 360 (my next gen console of choice, or rather the one that I happen to have). 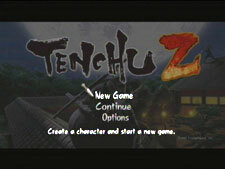 Recently when I made a trip to the local video store, I noticed they had Tenchu Z in stock — if you’re unaware, the Tenchu series focuses on stealth and action, featuring ninja warriors doing various ninja-y things. Back in the day, I picked up one of the Tenchu games that had been released for Xbox; while it wasn’t the greatest game I’d ever played, it was enjoyable. Thus, I decided to try out the newest next-gen version in the series. 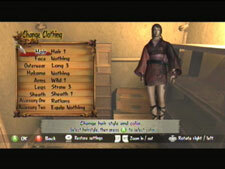 Much like the classic Perigee Apogee games of old, Tenchu Z lets you choose your character — play as either a girl, or a boy! You get to choose which character you wish to play, either male or female. 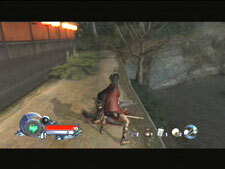 But Tenchu Z takes this one step further than the Tenchu games of old, because now you get to customize your character! Choose from various face styles, hair styles, and clothing styles to make your ultimate ninja warrior! As you progress though the game, you even unlock new faces, hair styles, and clothing to purchase. Wow! Once that’s out of the way, you get to customize your “partner,” who I have yet to see in my playthrough. Anyhow, your partner is automatically assigned the gender opposite of what you chose for the main character (and as you can see in the screenshot to the left, I made my primary character a female — which may possibly mean that I am, in fact, a girl). As the game begins, you’re treated to a small training mission that shows you the basics of the game. In what could be thought of as a massive loophole, you can repeat this easy training mission over and over and over to rack up easy money — you get scored on all missions, including the training mission. Uh, woo hoo? After that you start the game proper, always returning to the “Ninja Village” in-between quests, in order to purchase items, clothing and abilities. The first few missions — mostly dealing with assassinations and the like — are linear, but eventually you get a large number of different missions to choose from at once (though all are numbered). I’m not too far into the game — I’ve completed five missions so far, and the game tracker reports that I’ve completed 3% of all missions. Yikes. Stealth is obviously key in this game. You get no fewer than three different gauges measuring various aspects of your stealth: there’s a sound meter that indicates if you’re making too much noise; a light bar that shows how illuminated you are (and thus, visible to enemies); and lastly, there’s an all-in-one gauge that tells you both how far (roughly) the nearest enemy is to you, and their current level of alertness. If the icon is green, everything is normal; blue means an enemy is aware of you, but hasn’t seen you or has lost sight of you; yellow means you’re in their field of vision; purple means they’ve heard you; orange means they smell you (no, I’m not making that up), and a flaming icon means your cover has been blown (so get the hell out of there). Most of your kills in the game will be of the stealth variety; usually this means sneaking up behind an unaware enemy until an orange (or red) ring of kanji text appears on the screen — this, along with yet another icon indicating the enemy is now in “stealth kill” status, means you can take the bad guy down without him knowing it (until it’s too late, that is). If the kanji ring is red, this is a critical stealth kill, and gets you more points than if the ring was merely orange when you killed the poor sap. Visually, the game looks nice. 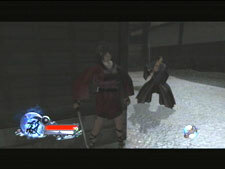 Nothing groundbreaking — in fact, it looks quite similar to the other Tenchu games I’ve played, though a bit nicer. The sound is decent, though admittedly in a stealth game there’s not going to be an abundance of sound effects or music used — and honestly, I spent so much time focusing on the various stealth meters I that didn’t really take too much note of the sound. Perhaps if Chief Oddball ever plays this, he can grade the sound, because he’s the sound effects master. Gameplay is pretty smooth — no slowdowns or choppy animations so far. The camera, for the most part, is pretty fluid — the only major problem I have is the first-person camera is way too sensitive (and by that, I mean the slightest nudge of the thumbstick sends the first-person camera flying halfway across the screen), and there’s no sensitivity adjustment for it in the options menu. One feature that could be viewed as either nifty or irritating is the fact that, aside from a basic map of the area you’re in, you have to find out where your goal is. For example, the first two missions are assassination missions, but you have to search around the map to find exactly which building your marks are residing in — the map offers no hints at all (and of course, the map is crawling with enemies, making exploration a bit tough). The lack of in-mission saves can be crippling as well (you only save after you complete a mission), especially if one tiny mistake causes you to have to start all over again. Lastly, as I mentioned earlier, you get scored on each successful mission, with a “Ninja 5” ranking being the highest you can get. Unfortunately, in order to get a high score, you pretty much have to slaughter every enemy on a level (since most points come from successful stealth kills), even if the mission outline doesn’t seem to suggest as such. For example, one of the missions I went on was to find my inside informant in a peasant village. Sounds easy enough, right? Sure enough, it was. I managed to infiltrate the village and find the informant very quickly, killing only one person in the process. My reward? A Ninja 2 ranking. So I retried the mission, making sure to kill as many people as possible. The result? Yup, Ninja 5. Because being a ninja means indiscriminately killing everyone you find, even if the situation doesn’t call for it. On the whole, though, the game is pretty fun. The lack of save areas is annoying, but so far none of the missions I’ve attempted have been long and complex, so it hasn’t been much of an issue yet. The enemy placement can be a bit frustrating as well, but that’s to be expected in a game like this. If you’re into stealth/action games, give this one a rent — though I wouldn’t shell out $50-60 for it.